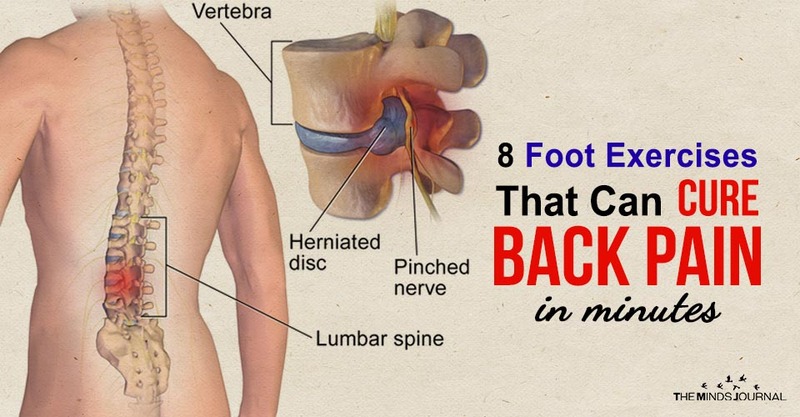 A lot among us suffer from back pain. Causes of back pain might range from inappropriate sitting or standing postures to injuries or any other disease. It can be mild or severe and it’s a general tendency to rely on painkillers when our backaches. While painkillers can give temporary relief, they are not permanent solutions and often come with side effects. Our feet play a significant role in maintaining our balance and they help in movement. Taking care of our feet with regular exercises not only helps us in maintaining our ability to is also effective in curing back pain. Stand up, bend your knees, grip the floor with the help of your toes for 3 seconds and then release it. Do this ten times at a stretch and thrice a day. This helps in blood circulation and also gives relief from back pain. Sit down, put your right leg on your left thigh, grab your right toe and shake in different directions followed by stretching for 10 seconds to the side. For best results, repeat this thrice per foot. Walk on your toes for 20 seconds and repeat this 5 times. Practice it twice daily and see how your ligaments become stronger. This will also improve your balance. Stretch your left leg in front you while facing the wall. Bend your left knee and your left hip forward and stay in this position for 30 seconds. Do it for your right leg and practice this twice daily. Place a tennis ball under your foot where the arch is there and move it backward and forward. Do it for few minutes daily and feel the difference. Sit on the floor, straighten your left leg and wrap an exercise band around a chair or bedpost which will hold it strong. Place the other side of the band on the top of your left foot and slid back until you feel a tension. Now, you need to flex your foot backward, hold it counting 0 to 5 and release it. Repeat this 10 times for both of your legs. This helps in keeping your muscles fit and strong. Lie flat on the floor with your legs bent upwards. Now, take one of your legs, stretch it out, rotate your ankle for 10 seconds in a clockwise position and then anticlockwise. Do the same for both of your ankles and practice twice daily. Doing this exercise helps in curing back pain because like heels and toes, ankles too play an important part in keeping your balance and mobility well. This one is a lot easier than the other ones. All you need to do is pick up a pen or a pencil with your toe and hold it for 10 seconds. Practice it for 5 times twice or thrice a week.